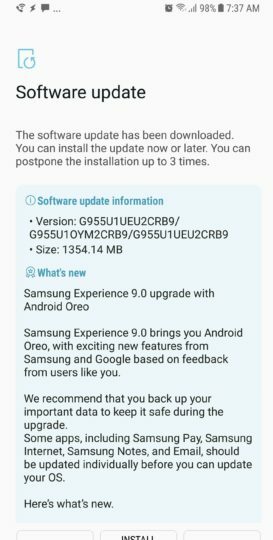 It has been a couple of weeks since major carriers in the United States starting rolling out the Android 8.0 Oreo update for the Galaxy S8 and the Galaxy S8+. All four major carriers have since released the update. However, those who own an unlocked Galaxy S8 have had to wait but they will be delighted to find out that the wait is now over. Samsung has finally released the Oreo update for the unlocked Galaxy S8 and Galaxy S8+ in the United States. Samsung had promised a few days ago that it would release Oreo for all variants of the Galaxy S8 and the Galaxy Note 8 in the US within the next couple of weeks. Carriers have also released Oreo for the Galaxy Note 8 and the company released it for the unlocked model just yesterday. 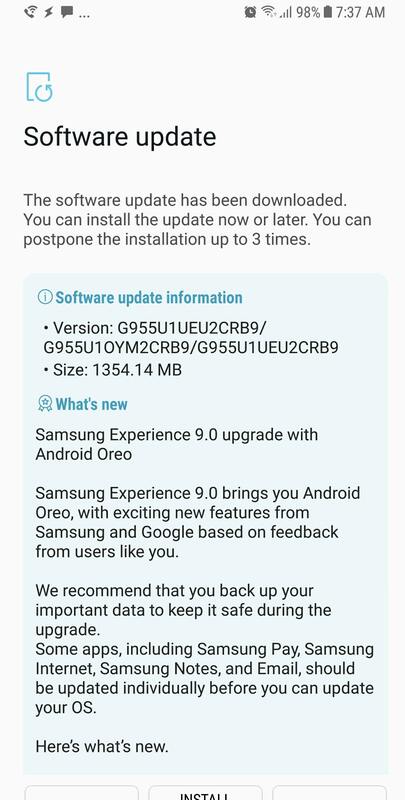 It’s now rolling out the unlocked Galaxy S8 Oreo update in the country. Samsung explained recently that the updates for unlocked variants arrive later than their carrier counterparts because the firmware has to go through additional testing to ensure proper functionality with all supported carriers as opposed to the firmware for carrier-locked units that’s only tested for that particular carrier only. Samsung is now rolling out firmware version G950U1UEU2CRB9 and G955U1UEU2CRB9 for the unlocked Galaxy S8 and Galaxy S8+ in the United States respectively. The update comes in at just over 1.3GB and brings all of the new features that are included in Android 8.0 Oreo with none of the carrier bloatware. Check out our detailed What’s New With Android 8.0 Oreo series to find out more about all of the new features included in this update. Unlocked Galaxy S8 and Galaxy S8+ owners in the United States should expect to receive an update notification on their handsets soon if they haven’t got one yet. They can also try to manually pull the update by heading to the Software update menu in the Settings app. A8+ 2018 India was updated with March Security update yesterday. hola tengo un s8+ modelo SM-G955U PROOVEDOR DE SERVICIOS XAA PERO ESTE PROOVEDOR SOLO ME APARECE PARA SM-G955U1 QUE PUEDE SER O QUE HAGO ME LLEGARA OREO ??? Did anyone not get Gif keyboard added to the Samsung Keyboard? It is noted in the update notes, but I don’t have the gif keyboard option. I got the UK update on my unlocked s8 a few weeks ago now ….. keep trying , they must be rolling it out real slowly to avoid server crush ! Got it at around 3am eastern time. So far so good, performance is excellent and new features are good to have.